Easter traffic is expected to peak on Thursday as leisure travellers battle for space on the roads with regular commuters. Transport information supplier Inrix warned that the worst time to travel will be between 4pm and 6pm, when traffic is predicted to be 28% above typical levels for that period. 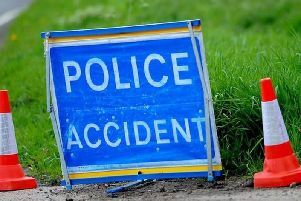 There were long delays on the M6 southbound in Cheshire during the Thursday morning rush hour after an HGV shed two large sections of concrete following a collision with a car, meaning two lanes were closed between junctions 18 and 19. About 20 million car journeys will be made between Thursday and Monday. Highways England advised drivers to allow extra time for their journeys and suggested they consider alternative routes. Tourism body Visit England said 6.6 million Britons are planning a trip involving an overnight stay over the weekend, up from six million last year. But the weather threatens to spoil some trips with rain, gale-force winds and lower temperatures set to blight much of northern England and Scotland as the bank holiday unfolds, while sunny patches could appear further south. In rural areas of Scotland and the North, spring could be mistaken for its predecessor - with frosty conditions poised to take hold on Saturday night, according to the Met Office. Temperatures will be a far cry from the summer-like heights across much of the country last week, instead hovering between 15C and 17C (59F and 62F) in southern England between Wednesday and Sunday, and between 11C and 12C (52F and 54F) in northern England and Scotland. Inrix said the worst affected roads during the Easter getaway will be major motorways, with some journeys taking as much as three times longer than normal. Drivers between junctions 9 and 21 on the M25 should expect delays of up to 90 minutes, extending a typical 40-minute journey to more than two hours. Motorists heading in both directions on the M6 and southbound on the M5 towards the West Country should also prepare for hold-ups of almost an hour, according to the report. Easter Sunday is expected to be the quietest day on the roads with 25% fewer vehicles than an average Sunday. A number of rail services will be disrupted as Network Rail carries out more than 200 engineering projects. Trains to London, Manchester, Bath, Edinburgh and Glasgow are among those affected. Network Rail said it is carrying out the work over the four-day weekend as fewer passengers use the railways on bank holidays. Travel trade organisation Abta reported that two million British holidaymakers will head overseas during Easter, with Good Friday the busiest day for travel. Spain is the UK’s favourite foreign holiday destination for the weekend, with temperatures set to reach 27C (81F) in Malaga on the Costa del Sol. Airports will be busy, with 425,000 passengers jetting off from Heathrow, 250,000 from Gatwick, 153,000 from Stansted and 150,000 from Manchester. Cross-Channel rail operator Eurostar is expecting its busiest ever Easter weekend with 163,000 passengers, up 12% on last year. Abta chief executive Mark Tanzer said: “Whilst many families may have already begun their Easter break, the Easter weekend is always a busy time of year for the travel industry with many holidaymakers taking advantage of the bank holidays to grab some much-needed sunshine or a trip to one of the world’s great cities.